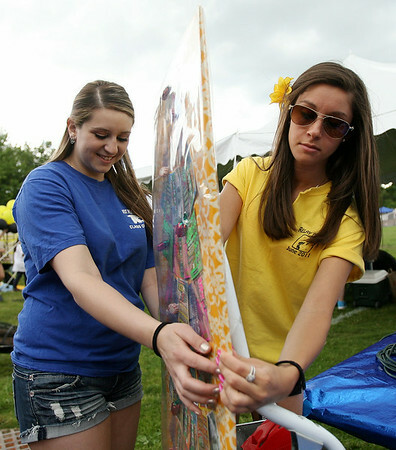 Former Peabody High School students Christina Ruggiero ('13), left, and Nikki Bavaro ('14), right, tape up a cardboard cutout decorated with lottery tickets onto a stand at the start of the Relay for Life event at the Peabody High School track on Friday afternoon. DAVID LE/Staff photo. 6/6/14.